Review The openSUSE project is back on track. This week version 12.3 of the Linux operating system distribution was unleashed, right on time, as a free download. This will be seen as good news after the organisational restructuring and delays that plagued the release of openSUSE 12.2 last year. While 12.2 was delayed, it was worth the wait, delivering a snappy, attractive and, perhaps most importantly, stable KDE desktop alternative to a world drowning in desktop "innovation". The latest openSUSE is no different and while the open-source project is often at pains to label itself desktop agnostic, going so far as to completely support GNOME, KDE, Xfce, LXDE and even the brand new Enlightenment 17, KDE remains the default choice on the install DVD and my recommendation for anyone wanting to try out openSUSE or KDE. The installation screens remain some of the nicest you'll find in a Linux distro, offering a simplified interface that gives you a good bit of information about what's being installed on your system. Finding the balance between simple and simplistic isn't always easy and openSUSE's installer does a good job of walking that line. 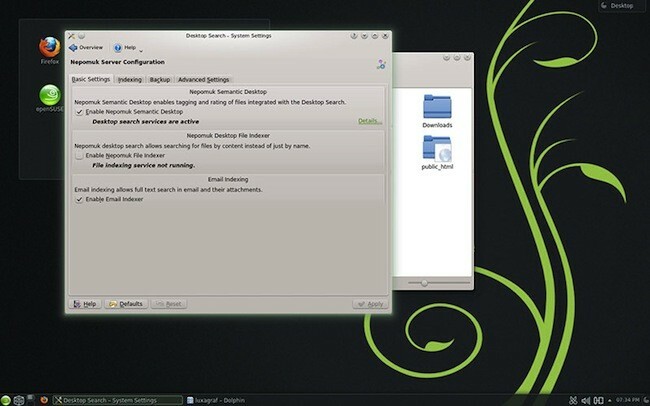 It also defaults to putting your home directory on a separate partition, a nice touch savvy users are probably already aware of, but which Linux newcomers may not otherwise do. 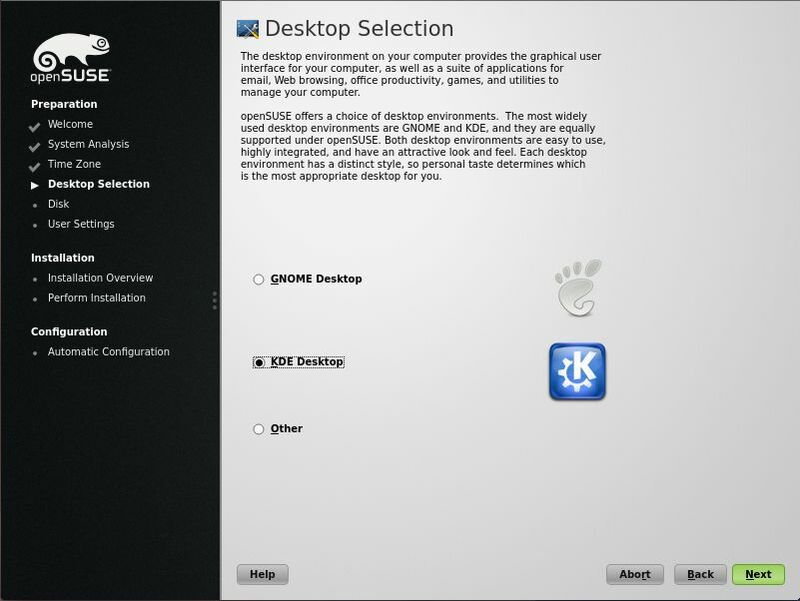 GNOME, KDE, Other. So many choices for the desktop. It's also worth noting that the openSUSE 12.3 installer should play nice with UEFI and Secure Boot. If you stick with the default KDE install you'll find that openSUSE 12.3 has done a little KDE leapfrogging, skipping over KDE 4.9 - which just narrowly missed shipping with openSUSE 12.2 - to deliver the recently released KDE 4.10. KDE 4.10 doesn't pack in the new features; unlike GNOME or Unity, KDE 4 has reached a level of maturity where the primary focus is on speed in incremental improvements rather than a constant barrage of new features - but it does offer several speed improvements that help make openSUSE 12.3 feel a bit faster even than its speedy predecessor. Chief among the improvements in KDE 4.10 is an overhaul of NEPOMUK, the document search tool that aims to make KDE the "Social Semantic Desktop". Strip away all the hype and what NEPOMUK really does is provide a much better way to find your stuff. It's very much a work in progress, but KDE 4.10 sees NEPOMUK cleaning up its act when it comes to memory use. How do you find files in openSUSE? Search me. Here are the NEPOMUK settings. Changes under the hood should mean NEPOMUK indexing no longer grinds your desktop to a virtual stand-still. The initial indexing still takes some time, but in my testing the changes seem to make NEPOMUK work quite well, eliminating the need to limit the amount of memory NEPOMUK can use - greater control over the software can be found by heading into the Desktop Search settings panel. KDE 4.10 also brings a few updates to common KDE apps such as KMail, which features a smarter quick search tool that scans the full content of your email. The Okular PDF viewer has also been updated as have other KDE standards, including Kate and KWrite. OpenSUSE also includes some extras in its KDE setup (provided you install from the DVD), such as the photo editor Showfoto, as well as non-KDE apps including Firefox and LibreOffice, both of which are somewhat nicer than the default KDE offerings. Is it time to do some work already? 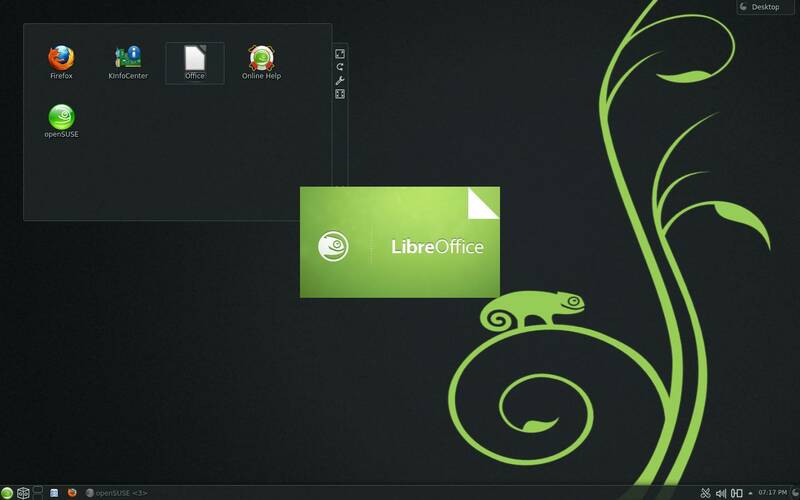 Fine, fire up LibreOffice. 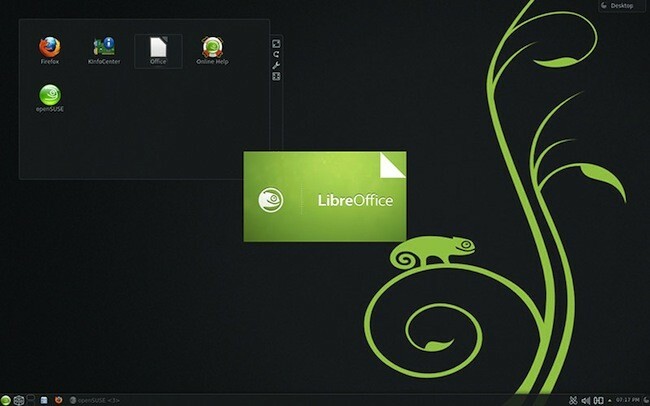 It's worth noting that openSUSE has opted to stick with LibreOffice 3.6, though if you simply must have the recently released 4.0 you can install it yourself.